When sourcing the perfect dining room table for a modern, eclectic or transitional decor, remember that the quality of materials and craftsmanship along with generational durability are as important as the design. In this throw away world, we are often bombarded with details and made to overlook quality in focusing simply on design and flashy advertising techniques. 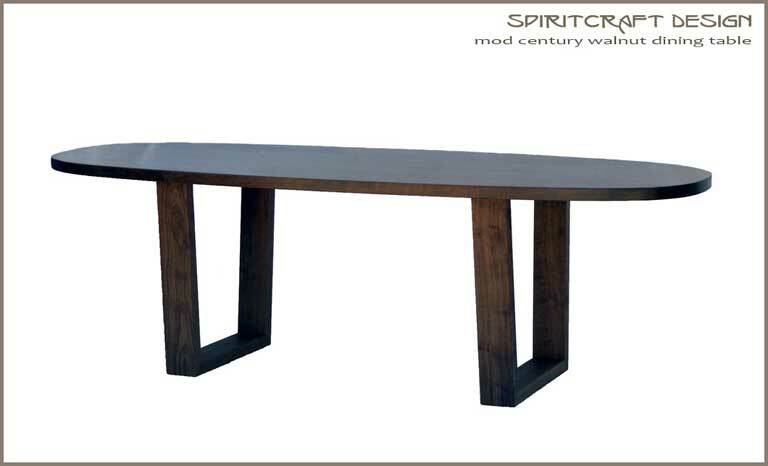 We have been made to chase the latest hot stain color such as “espresso” or “San Gabriel Gray” rather than what a dining table or other piece of fine furniture is actually made from. We are of the mind that quality matters and that Mother Nature did a pretty fine job in providing us with inherent beauty and timeless appeal in hardwoods such as natural, old growth North American Black Walnut. 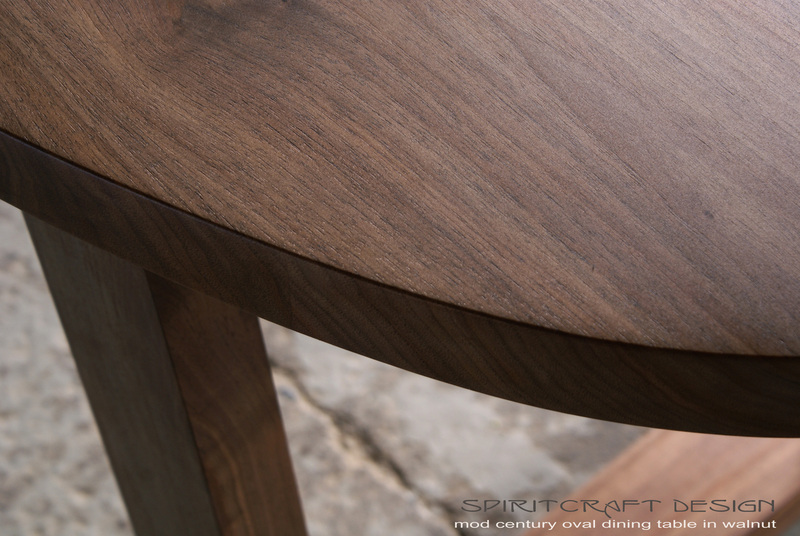 As an example of a timeless design that visibly displays quality materials and craftsmanship, our original “Mod Century Oval Dining Table” in solid Walnut seems to fit the bill. These substantial and visually appealing dining room tables offer comfortable seating arrangements in a timeless original design. They are crafted using traditional, time tested joinery methods that will allow generations of worry free utility while allowing for a significant design statement within your home decor. 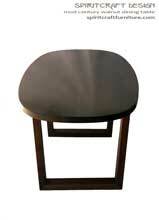 Click on the images to open large versions depicting these heirloom quality furniture pieces. 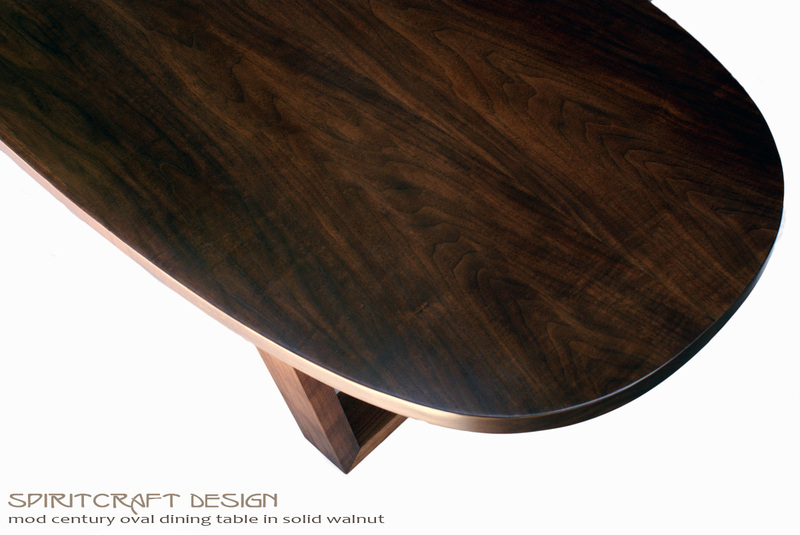 Natural solid Walnut hardwood as a unique and original art-form. Solid Walnut hardwood in a quality piece of furniture, finished naturally. 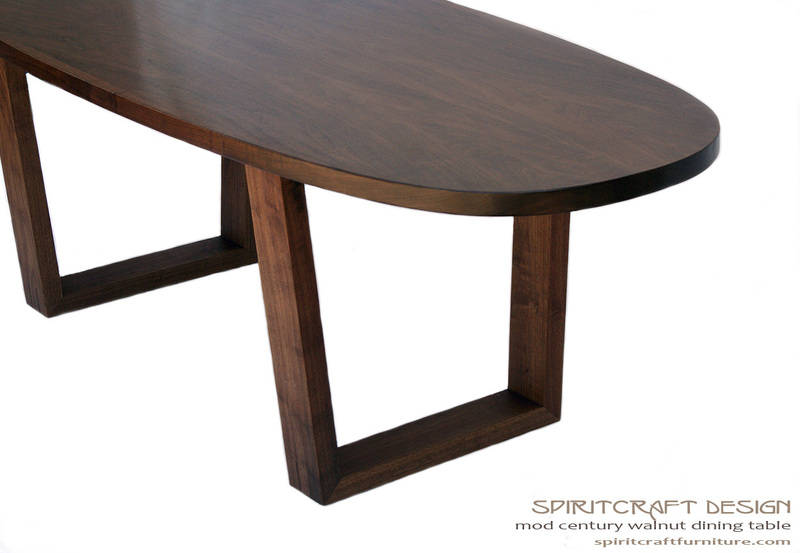 This modern, Mid Century influenced dining room table is crafted from 100% solid hardwood. 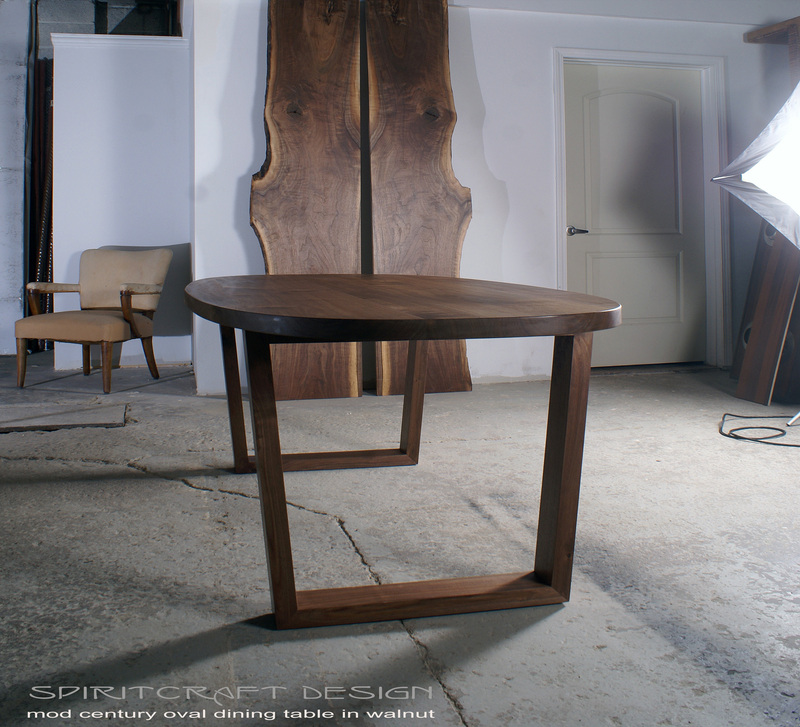 The two tables pictured are 80″ and 96″ wide respectively and 36″ deep by 30.5″ high and were crafted from solid Black Walnut in our East Dundee, Illinois workshop. 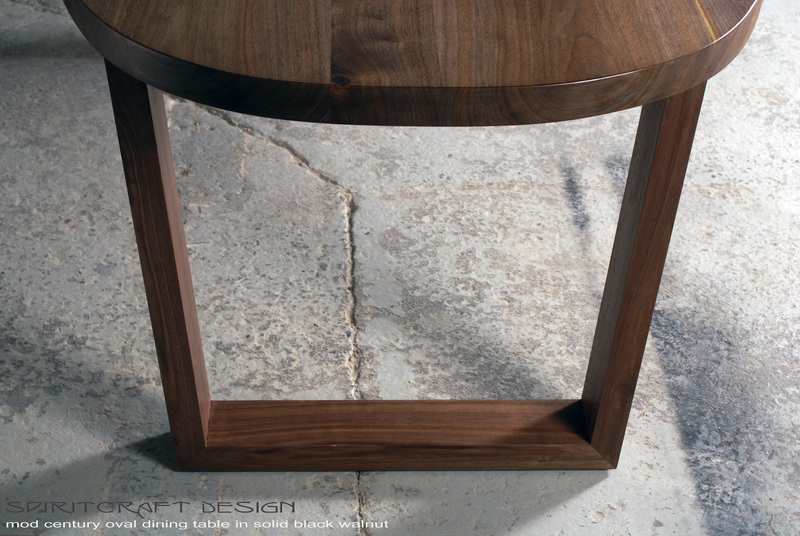 The solid Walnut legs are mitered and splined to form a appealing open leg arrangement that supports the 1.625″ thick slab top. The splined joinery used in the table legs offers superb strength and announces quality in being a visual design element. This original design has also been adapted into rectangular and oval cocktail tables and cross, legged round dining and occasional tables. 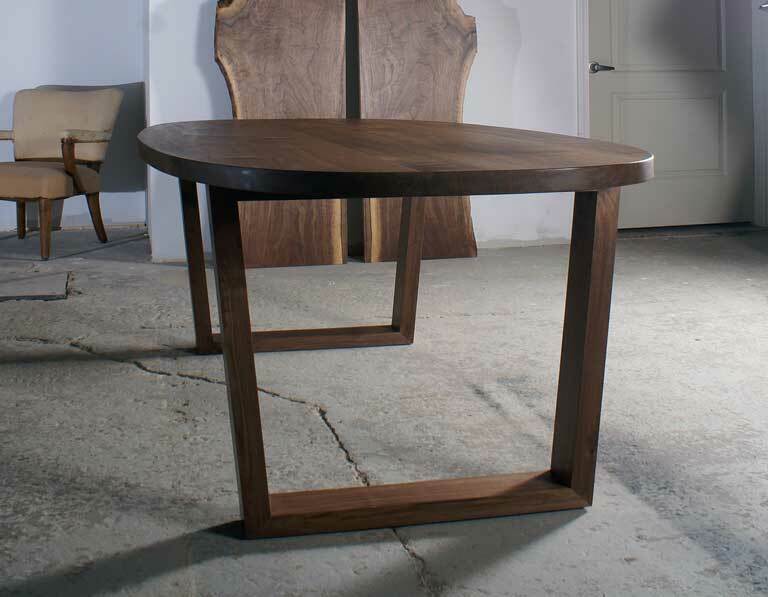 The Walnut in these tables and other pieces within the Mod Century Collection is rescued from old growth, storm downed trees. The hardwood quality of our “rescued hardwoods” far exceeds that which is commercially available in terms of grain, color and density. In particular, the Black Walnut that is available commercially is usually steamed to change the white sapwood into a uniform brown tone. This steaming procedure which is used to create an overall brown tone in Walnut that is harvested from small, young trees destroys the beautiful colors that are inherent in mature Walnut hardwood. While steaming masks the new sapwood in changing its color the process cannot increase its density which can only be found in aged Walnut hardwood. 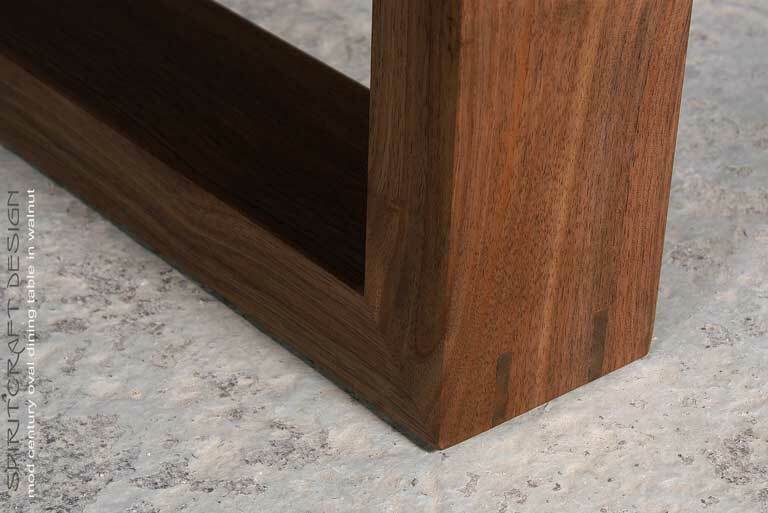 Splined miter joints in solid Walnut for generational endurance and visual appeal. A wonderful finish to the beautiful hardwood that offers protection while allowing a nice hand. This mid century influenced table was finished with a hand-rubbed oil and varnish mix and then finished with a durable top coat that will allow years of regular use. The Mod Century Dining Table is wonderfully and carefully finished to allow adequate protection while allowing the feel of the hardwood to remain apparent. The fine finish is easy to care for and allows for a natural appearance and hand as opposed to finishes that cover and mask the grain with a “thick plastic coating”. The Mod Century Dining Table is available in nearly any size desired in a dining table in rectangle, boat shaped and in the imaged oval design. 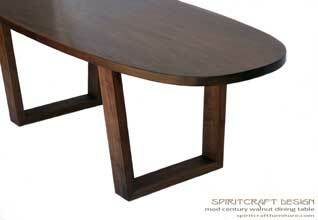 Pictured in Walnut, this table is available in nearly any hardwood or combination of hardwoods. Our solid hardwood furniture is available locally through our Dundee design showroom in Suburban Chicago and is shipped nationally via our meticulous and affordable blanket wrapped delivery partner. 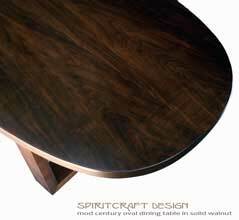 Open leg design accomplished with solid Walnut and traditional joinery. 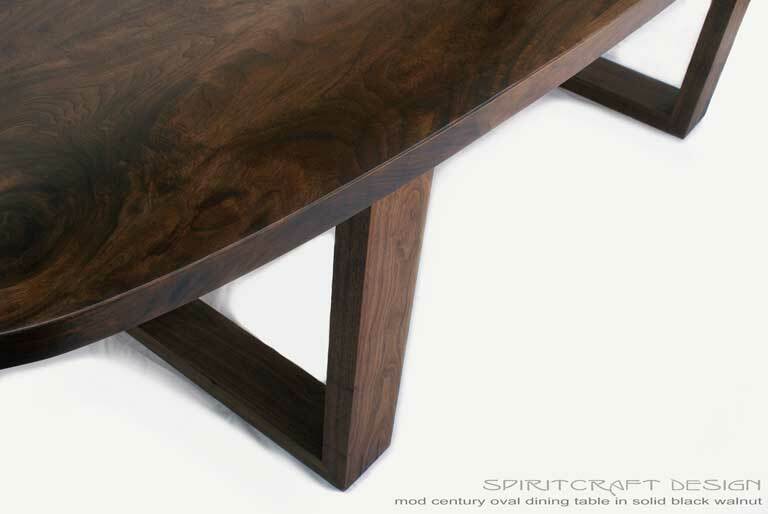 Spiritcraft Design offers original and exclusive designs influenced by Mid Century Modern, Prairie and Shaker furniture styles and is crafted from solid hardwoods to beautifully endure decades of real use. For additional information, call 815-451-9734 or email us at All photos copyright spiritcraftdesign 2014. Serving Barrington, Arlington Heights, the Chicago area and suburbs from our East Dundee, Illinois home decor showroom and furniture workshop. Please keep in mind that comments are moderated.